our last DIY post, we showed you how to fancy up those ugly power cords running around your office. 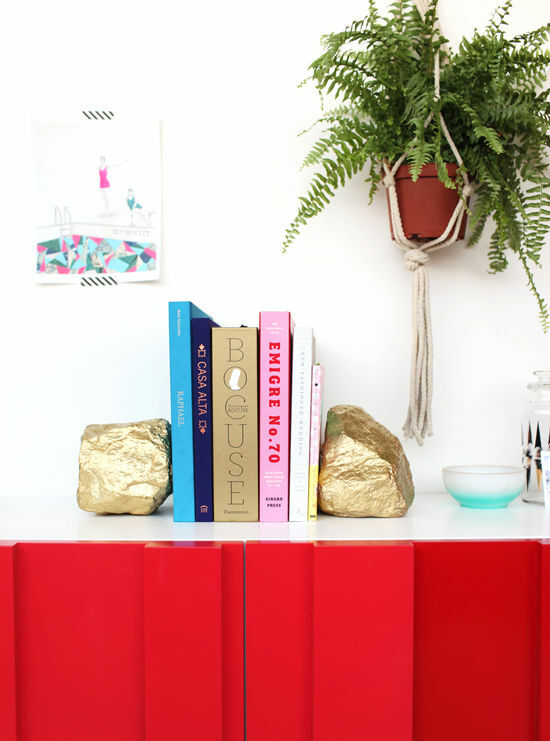 this week we’re going to show you a VERY simple way to add some glamour to your bookshelf. buy some rocks…or just go on a walk and find some you like. then all you have to do is spray paint them gold. (makes me miss sifting for gold in that computer game oregon trail) we added a pink ombre to the bottom…we made paperweights…polkadot designs. make yours unique! • we added cork pads to the bottom so they don’t scratch the surface & move easily. and that is IT! not a hard project, but a nice impact on the shelf, right? we hope you give this one a shot! Aah…I love this idea. I’ve been wanting a pair of cute bookends for a while, but my are they ever expensive! Total sticker shock. This is so simple and lovely. Must try. Happy weekend, Bri! Super cute and super affordable if you actually find the rocks yourself. Love the ombre ones in the first photograph. LOVE – I’ll be making these this weekend. Thanks for the idea!!! Such a simple but fun DIY! I will definitely be trying this! These look so cool and easy! A simple addition my desk might just need…now I just have to go outside and find some appropriate stones! this is amazing, i loved them in your office tour! i’ll definitely be making some of these soon! LOVE this idea! How fun and they look really nice too! BUY some rocks? That notion is just hysterical to me. We live in a Philly rehab, and have a backyard full of roughed up bricks. I’ve been meaning to spray paint a few as bookends for my daughter’s playroom. Maybe I need to do a few for my office too. I am in love with this. Definitely sectioning off my design books this way. Thanks for the diy! I love these types of DIYs; so simple, yet they make such a statement! Cute! Quick question – does the spray paint every rub off or discolor the bookshelf?? What a great idea and they look really great. 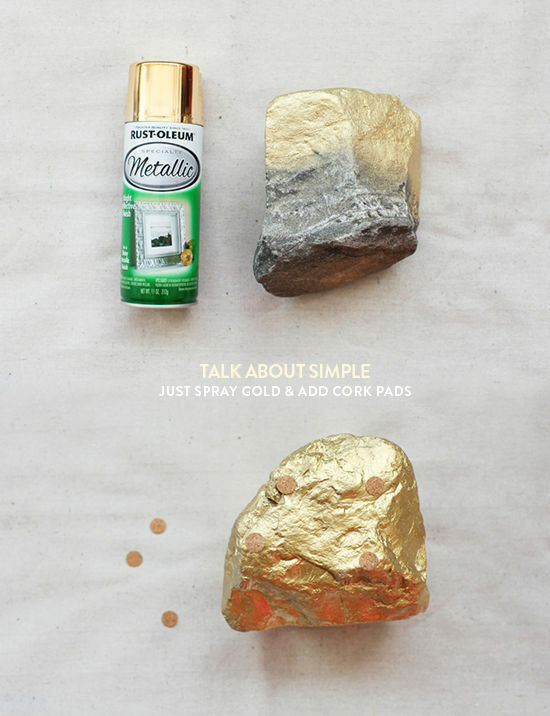 With the gold triangle – how did you get just that bit painted and not get splotches on the rest of the rock. I was JUST searching the internet for some fun bookends last week. This is perfect! Can you give us any clues as to how you achieved the ombre effect in the first photo? I’m dying over those. Love this! I am rock OBSESSEDDD!! 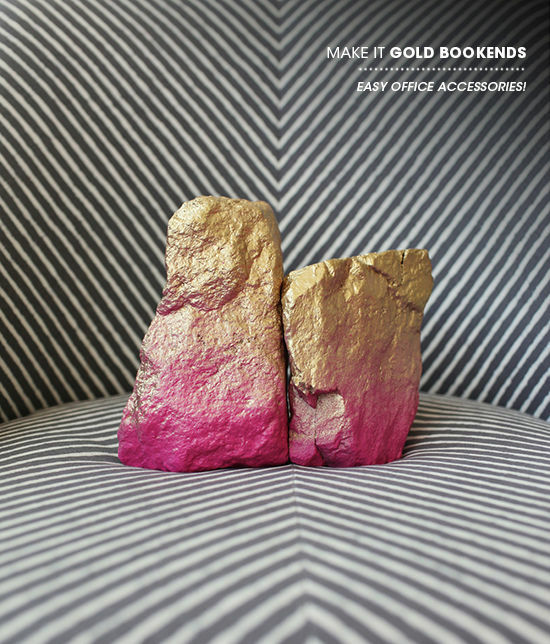 You mention that you want readers to let you know when credit is not properly given, and this post idea is contained exactly on the radical possibility site (Lazy Sundays: Making Your Own Gold Bookends from April 29, 2012). I think she deserves credit here. Really cool and simple idea. This will go very well on my white shelf! about this topic. I really liкe all of the pοints you’ve made. Lovely golden nugget book ends.